Waiting for the world to change? hehehe. No. 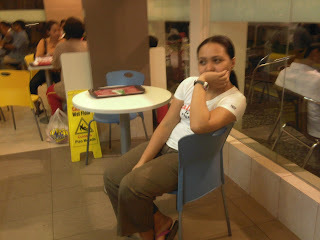 I am waiting for the food and my friend, Michelle in the counter. There are really times when it is nice to let just time pass, looking at people and daydream. No problems and how I wish I could spend everyday like that. I earn while eating, sleeping and even during leisure time. I manage my time and I can wake up late and spend time at home in pajamas. If I have the luxury of money and time, I will spend it with my family traveling. Visiting places we only see in magazines and television. Dining at unique places and having fun. Wish a genie grant my wish and God be at my side. Oooppps, Michelle's here. YUM YUM, I really love french fries and cheeseburger. Oh, what was I talking a while ago?